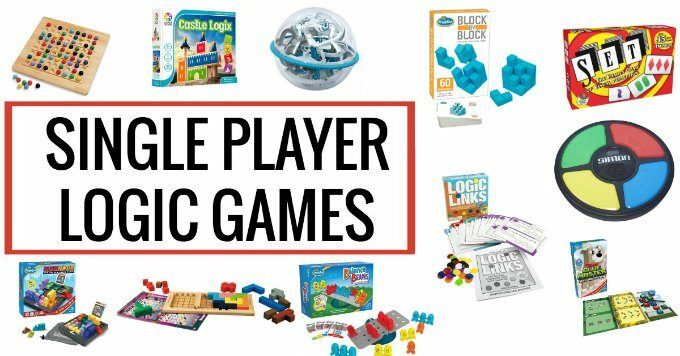 There is no greater gift you can give parents than a single player logic game for their kids. Keep the quietly busy for house of independent play. Convinced, yet? I thought so. We happen to have a rather larger than average collection of solitary brain games for kids for precisely the reasons I outlined above. (Also because we are game addicts.) Today I’m sharing a gift guide list of awesome games. Each of these brain teasers makes kids smarter and has been a quality investment in my children’s future and my sanity. ThinkFun Rush Hour. This has long been my top game recommendation for kids. I’ve bought it, or the version for younger kids, Rush Hour, Jr., for more birthday presents I can count. Challenge cards in several levels each have a puzzle that kids solve by rearranging the vehicles to drive the red truck off the board. Splendid. You won’t regret it. Extra challenge cards are available. Ages 4 and up for Rush Hour, Jr. Ages 7 and up for Rush Hour. Balance Beans. ThinkFun recently sent us this game to try out and I was impressed that both my 7 year old and my 11 year old enjoyed it. Challenge cards in different levels display puzzles to solve. Each puzzle involves setting up the red beans and then figuring out which beans to add to the see-saw in order to make it balance. It is actually a little more challenging than it sounds. But the thing that sold me is that each puzzle can also be solved by algebra. That’s right! Algebra. Which is why my 11 year old math nerd enjoyed it so much. Although older sibling may enjoy the game, stick to ages 5-10 for gift giving. Colorku. This is a colorful, oversized version of Sudoku. We have gotten so much mileage out of this game. Even though it was pricey, it was totally worth it. My son has spent many hours in independent play over the years. The wooden board and marbles are a pleasure to use. Challenge cards come in different levels and expansion packs are available. Katamino. If you are looking for an heirloom quality game that will continue to be a fun challenge into their adult years, look no further. This puzzle game can be played as a single player game or with 2 players, making it very versatile. Camelot, Jr. has lovely wooden pieces. Challenge cards contain puzzles that kids solve by creating pathways between the princess and prince. Bonus: kids can use the blocks as part of their pretend play. Ages 4 and up. Clue Master. ThinkFun also sent us a copy of this game to try out since we are big fans of Code Master, and it is just as fun. The concept is similar—a single player uses reason and logic to solve puzzles. But in this case, the player has to make logical deductions based on information he can’t necessarily see. It is a very challenging game but there are three difficulty levels so players are able to build on previously learned skills. Ages 8 and up. 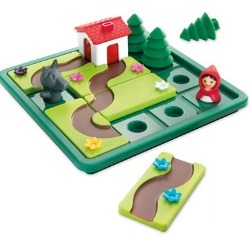 Little Red Riding Hood merges storytelling and a logic game! (Winner 2016 ASTRA Best Toy) The game includes a story book, plus 48 puzzles. Kids strive to get Little Red to grandma’s house before the wolf gets there! Ages 4 and up. Not a fan of Little Red Riding Hood? Three Little Piggies is a very similar game. Perplexus. I’m not sure this could be considered a logic game but it has gotten so much use in our house it deserves a mention. This spherical maze is a great challenge and requires patience and a steady hand. The kids are super quiet while they strategize how to complete the brain teaser! There are several versions available, including a Death Star! Simon Electric Memory Game. Do you remember this marvelous game? I love leaving it out to be rediscovered by the kids on a rainy day. They always rise to the challenge and although it’s not silent, it sure keeps them occupied. And I know they are stretching their memory and attention skills. Win-win! Block by Block is a great game to take on travels. It is a 3D puzzle game. Kids must solve puzzles by arranging the blocks in the formations illustrated on the challenge cards. Other versions: Brick by Brick and Shape by Shape. Ages 7 and up. Set is a family game, but it is very versatile and can also be enjoyed by a single player. Players gather “sets” of cards based on logical rules. Ages 6 and up. Logic Links is now available as this snazzy box set, but we have been enjoying the workbook version. Kids exercise spatial and logical deductive reasoning skills and they solve clues in order to put colored discs in the right order. Ages 6 and up. IQ Link, IQ Twist are great portable puzzles for on the go (think: no more iPad!). Solve puzzles by fitting irregularly shaped pieces on the game board. Thank you for listing the games, your article helped me a lot is choosing presents for my child.